A grant of $2,275 has been awarded to Colleen Ahland for her research on “The Classification of the B’aga languages.” The B’aga languages are a group of four underdocumented languages in Ethiopia. Their classification has been debated, as has the classification of the five Koman languages of Ethiopia and Sudan. Dr. Ahland’s research is showing that the B’aga and Koman languages are related and form a subgroup within the broader Nilo-Saharan family. This grant will allow her to present her findings at the Nilo-Saharan Colloquium in Vienna (29 May to 1 June 2019) and to get them published in the proceedings. Determining the classification of these languages not only contributes to a better understanding of the social history of these peoples, it can also contribute to the language development efforts in these languages since solutions found for one language are often applicable to other closely related languages. Colleen Ahland is a Linguistics Consultant for SIL in Ethiopia and also serves as Classifications Editor for the Ethnologue; she holds a PhD in Linguistics from the University of Oregon. One purpose of the Pike Center for Integrative Scholarship is to serve language communities on the margins of society by doing research and publication that addresses issues they face. Pike Center is pleased to announce the launch of its Small Grants Program as one of the mechanisms for supporting that aim. This has been made possible by the receipt of a generous donation to the Pike Center's general fund. The Issues page offers a broad description of the kinds of research that can contribute to the goal of language being an instrument of human flourishing. Any research leading to publication that falls within the scope of what is described on that page is within scope for the Pike Center Small Grants Program. Any member of an organization that is part of the worldwide movement of language development and Bible translation that our namesake, Kenneth L. Pike, helped to establish is eligible to submit a grant application. The program will make awards three times per year, with the submission deadline for grant applications being January 10, May 10, and September 10. Contact grants@pikecenter.org for more information. An article about the legacy of Kenneth L. Pike was published online earlier today by Christianity Today: “Kenneth Pike and the Making of Wycliffe Bible Translators and SIL International,” by Boone Aldridge (Corporate Historian, SIL International) and Gary Simons (Director, Pike Center). The article begins with the story of SIL’s founder, W. Cameron Townsend, and the birth of his vision for a worldwide Bible translation movement that would be empowered by scientific research. It then tells the story of Pike and how, after developing into a world-class linguist, he played a central role in bringing that vision to reality. Issues of language and identity can make or break any kind of development project. They determine the degree of access to new information and influence a community’s desire to make any kind of change in the first place. Issues like these are to be addressed in the first Pike Center symposium which will be on the theme of Language and Identity in a Multilingual, Migrating World. Organized by Fellows Steve Quakenbush and Gary Simons, the symposium will take place as part of SIL's 7th International Language Assessment Conference to be held 9–16 May 2018 in Penang, Malaysia. Click cover to go to ebook. Pike Center is pleased to announce the availability of a new ebook that tells the story of scholarship as a key part of SIL’s vision and strategy. When SIL was established in 1934, our founder articulated a threefold purpose which wove together scholarly research, Bible translation, and integral development in service of language communities on the margins of society. In addition to discussing the role of scholarship in that founding purpose, the book relates the history of how Kenneth L. Pike came to be the key player in turning the founder’s vision into a reality. This book, edited by Pike Center director, Gary Simons, has its genesis in the efforts to found Pike Center and helps to explain why we have established it. The story of how SIL has sustained a commitment to its three founding goals deserves wide attention because of the encouragement it can provide others who believe that Christian faith requires intellectual and cultural, as well as religious, commitment. It also deserves attention because of contemporary currents in many spheres of life far beyond linguistics that still pose true faith and disciplined intellectual endeavor as incompatible. 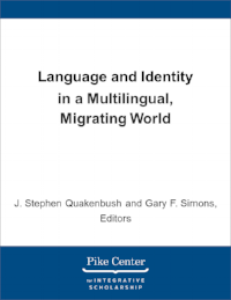 These are the issues to be addressed in the first Pike Center symposium which will be on the theme of Language and Identity in a Multilingual, Migrating World. Organized by Fellows Steve Quakenbush and Gary Simons, the symposium will take place as part of SIL's 7th International Language Assessment Conference to be held 9–16 May 2018 in Penang, Malaysia. A Call for Papers has been issued.